Parents, grandparents and other adults who interact with children and adolescents are invited to a free forum on Thursday, April 12 to learn about the insidiousness of cyberbullying and how to combat it. Summit Police Sgt. Thomas Rich, an expert on cyberbullying, will educate adults on how cyberbullies not only use texts and emails to harass victims, but can harm them anonymously on social media and gaming apps such as Instagram, Snapchat, Facebook, Twitter, Minecraft, Roblox, and Pokémon Go. 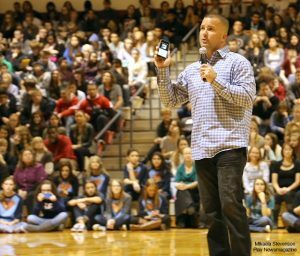 A police officer for 20 years, Rich has addressed cyberbullying at more than 700 events nationwide, and on segments of CNN, Good Morning America and the Fox network. Cyberbullies use various tactics, such as posting hurtful comments on social media and apps, sending harassing emails and texts, impersonating a victim, and doxing, in which the perpetrator makes a victim’s personal information public online. An estimated 15 percent of high school students reported being bullied electronically, according to the 2013 New Jersey Student Health Survey, the most recent available.